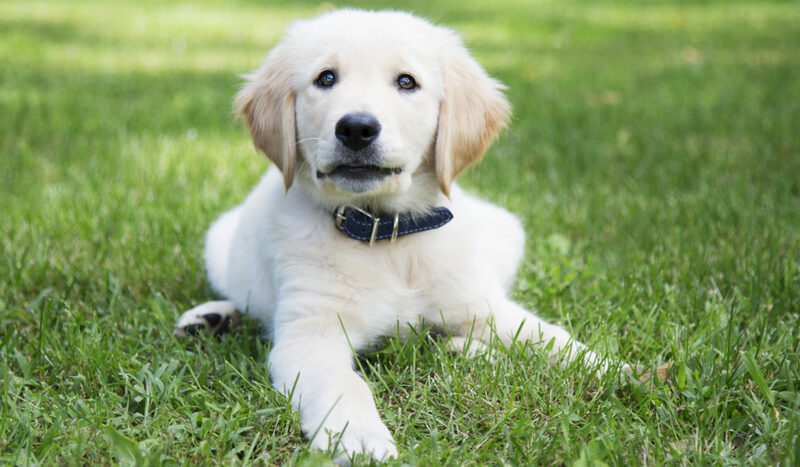 If you are new to the dog owner world, you might be confused when it comes to choosing the first dog collar for your new pet. There are so many options, brands, designs and materials – how could you possibly choose the best collar for your dog? Every dog is a little bit different in what they need. The best way to pick the right collar for your pooch is by breaking it down into the different qualities you need. We’d recommend starting with the overall style of the collar. You need to decide early on as to what you want the collar to do for your dog. Are you going to be using it for everyday wear and identification? Training? Walking? 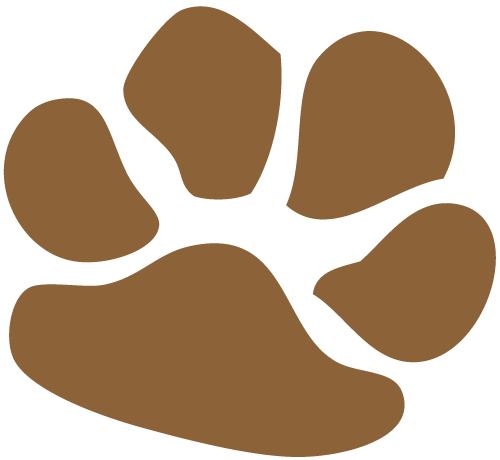 Does your dog have collar style requirements for the dog park, doggy day care, etc? This is dog collar with a prong style buckle that has holes punched in it for adjustment. Think of it as a human belt buckle. This style of buckle works well for dogs that wear their collars all of the time as these buckles are a bit harder to undo regularly. They are commonly found on leather dog collars or collars made of other sturdy materials. 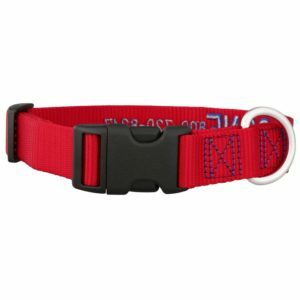 This collar comes with a plastic or metal buckle that has a female and male buckle end that clips together. Generally, the buckle will hold tightly when it’s being pulled on, but when the sides are tightened, the buckle mechanism causes the collar to come off fairly easily. 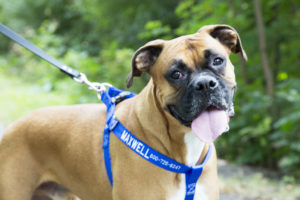 This style can be required at certain boarding and doggy day care facilities because it makes it easy to remove a dog’s collar if they were to get it caught on something or another dog decides to hang on for dear life. In the cat world, they have a variation of this buckle for cat collars called a breakaway collar. For a breakaway buckle, it’s easy to pull the buckle apart with added pressure on each side. This means that if the pet gets their collar stuck on something, the collar will come apart if they pull hard enough. 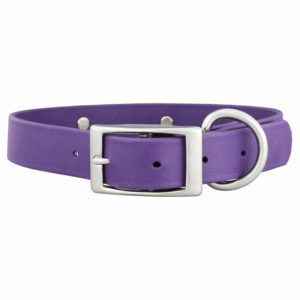 While we do recommend this for cat collars, we don’t carry breakaway buckles for dog collars. 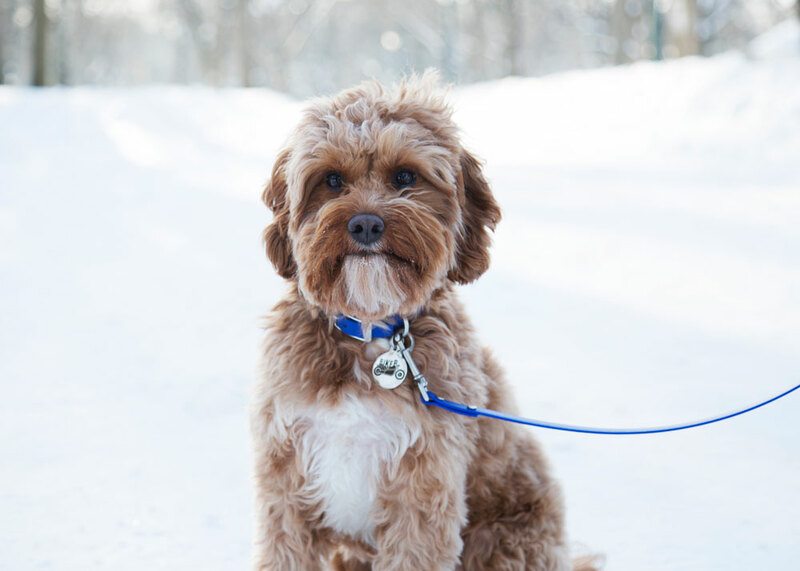 When dogs put pressure on their collars, it’s when they are on a leash or tie-out and in those cases, the collar coming off could put the dog in serious danger. This style of collar is common for hunting dogs or dogs that have a larger area to roam. A safety collar has an O-shaped ring built into the collar about halfway between each end. This O-ring is there to provide an extra pivot point on the collar. That way, if your dog gets their collar stuck on a branch, a rock or anything else, the collar won’t choke them. You can learn more about the safety collar here. 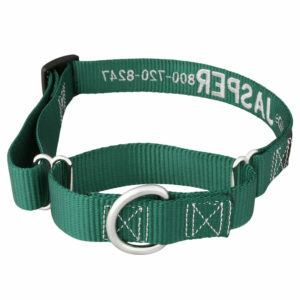 A martingale dog collar is perfect for dogs that back out of their collars or need a bit training for pulling. When walking, it gives the pet parent a bit more control over your dog. 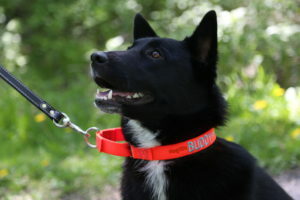 Learn more about the martingale dog collar and how to use it here. 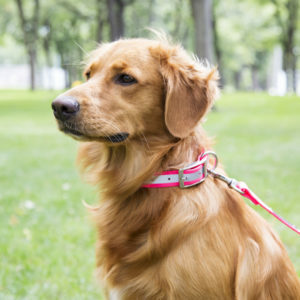 The ScruffTag collar design is unique to dogIDs specifically. It was developed by our founder, Clint. On any of our ScruffTag Collars, the straps of the collar are built around a rectangular ID tag. This way, the personalization that is engraved onto the nameplate will sit on the back of the dog’s neck instead of hanging below their mouth. If your dog gets lost and a stranger finds them, they can easily read the information needed to return your pet to you. 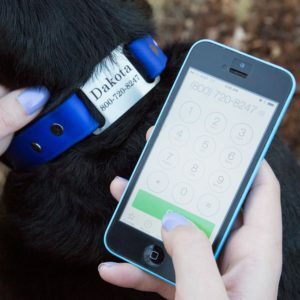 Additionally, the ScruffTag collars can be made with different styles of buckles and materials so that you can get the other things you need from your dog’s collar. 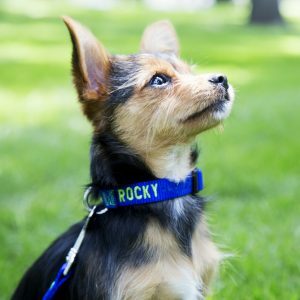 While technically this is not a style of dog collar, this is totally an option to consider for your furry friend. If you have a dog that is a strong puller or has a delicate neck, a harness is a great alternative for walking. By putting the pressure of the leash clip on the dog’s body/chest instead of their neck, it’s much easier to control them and avoid injury. Now that you’ve narrowed down what you need for a collar style, it’s time to think about the material you’d like your collar to be made out of. You may be looking for a collar purely for looks or you might be looking for durability. Your dog may have sensitive skin, so you need something that won’t exacerbate that issue. Nylon is one of the most common materials for dog collars to made from. It’s usually less expensive and gives you a lot of options for colors and designs. It’s also pliable, so a great option for smaller dogs or dogs with more sensitive coats. However, nylon is not the perfect material for every dog. If you have a dog that spends a lot of time outside or gets wet all the time, nylon collars can get pretty stinky over time. They also don’t usually last as long as other sturdier materials like waterproof biothane or leather. If you like the idea of nylon, but your dog has nylon allergies, you can also find fabric collars that are made from cotton. Fabric dog collars have a lot of the same properties as nylon, but usually only have a nylon core so none of it touches your dog’s skin. This material is a great fit for active dogs, especially water-loving breeds. It can hold up to pretty much anything your dog can throw at it! Plus, it comes in variations that have reflective or glow in the dark strips built right into the collar for added safety. Leather is the traditional material type for dog collars. There’s something very elegant and classic about a dog wearing a leather dog collar. That being said, leather is not just for looks! Because of the way the leather is made for dog collars, it has some built in protections from the elements and is extra durable. It also softens over time and exposure to your dog’s natural oils. We carry a few varieties of leather material types, including english bridle leather dog collars, padded leather dog collars and soft Italian leather collars. 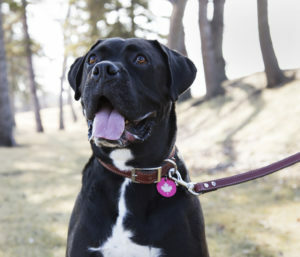 The bridle leather collars are a better match for larger breed dogs with active lifestyles while the padded collars work great for dogs with sensitive skin or really long necks. Our customers with toy breed dogs love the Italian leather collars as they are lightweight enough to fit great on teeny tiny necks. At dogIDs, we want to increase the number of dogs that get returned home. The best way to do this is to make sure that no matter which style of collar you pick, you personalize the collar with the most important information. 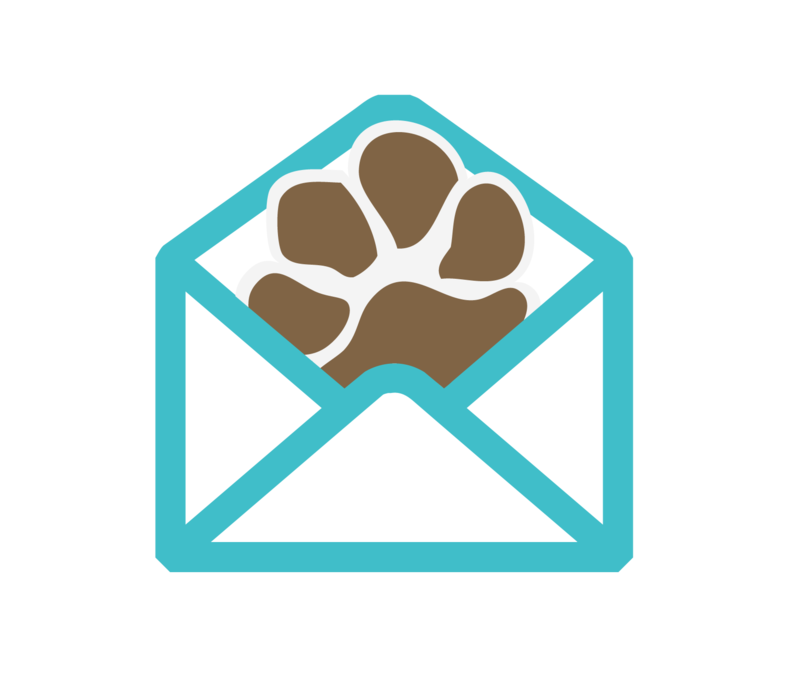 Whether it’s engraved, embroidered or embossed, it’s important that your dog carries your contact information on them at all times! Want more help choosing the right collar for your dog? Check out our collar advisor tool! Want more information about dogIDs collars? Check out these blogs. cease singing. ?Therе аre lots of ways to worship. 1. Simply fold the end of the packing tape over. to go find more toothpicks. Be prepared to poke yourself in unforeseen places with lost toothpicks (specifically those ones on the flooring). 2. YOU HAD TO EMPTY YOUR BED ROOM CABINET! Reason # 1 – Clothing are heavy, and depending upon the sturdiness of your cabinet, they will move around and potentially skew the drawers. This happened to me with a less costly dresser. I had the ability to get it back together, which is good due to the fact that I was a college student and didn’t have funds for another piece of furniture. boxes and boxes of dirty knickknacks using his significant collection of knit golf shirts. They were absolutely gross after being twisted around filthy objects, extended, and some had holes from the sharp edges of some of the things. location sooooo much easier. I discovered that lesson the hard way. Like clothing, they are heavy. Loading them in travel suitcases just works if you utilize a small suitcase. quality of your bag, you may also wind up ruining your luggage. Pack your clothes in them instead since it’s exactly what they were made for. you may love the modification these pics result in within your home. for either selling an authentic bit of art. soil, to aquaponics, which includes rising crops (or fish) directly in water. Many businesses find on-premise CRM more secure since they will be able to keep their data behind onsite firewalls. Sales copywriting using software programs are quicker than when the work was assigned to a sales copy writer. Yes! Finally something abolut indiian prints for sale. Thanks for the guidence on selecting right dog collar. 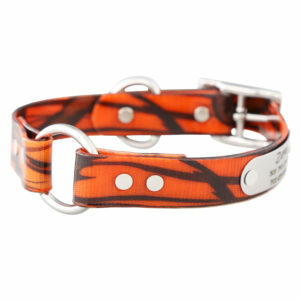 You can get simple, personalized, and charming dog collars online from sassydogfashions.com.